Starting 2/17, ShopRite has Scott Bath Tissue 12 roll and Cottonelle Bath Tissue 12 pack priced at only $7.99 and $7.59 each. 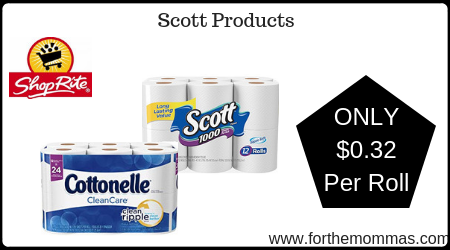 In addition to this, we have Scott and Cottonelle coupons to use on this deal . Stack it with a $2.00 ShopRite super coupon, Ibotta rebate and Catalina that will make your final price ONLY $0.32 per roll!